Protesters duck as Iraqi security forces fire tear gas during a demonstration against unemployment and a lack of basic services in the southern Iraqi city of Basra on Sunday. Iraqi officials flew to Tehran this week to try to cut a deal with Iran for electricity, attempting to defuse potentially destabilizing anti-government demonstrations spreading through the country's southern provinces. The protests started a week ago amid anger over unemployment, corruption and lack of access to basic services such as power. Iraq's health ministry announced Monday that eight demonstrators had been killed in the unrest. Iraqi police say dozens of security forces have been wounded. Some analysts said the crisis, which could threaten Iraq's caretaker government, illustrates the unintended consequences that U.S. sanctions against Iran are having on an American ally. The trade sanctions were reimposed after President Trump withdrew in May from a 2015 nuclear deal between Iran and six major powers. Iraq — where temperatures in the south soar up to 120 degrees in the summer — has been importing electricity for several years from neighboring Iran, one of its biggest trading partners. But after re-imposition of sanctions, Iraqi officials say, Iran can no longer access Iraq's payments, and it recently stopped the electricity supply. "Iran can't receive the payments because of the sanctions, so they stopped providing power to Iraq for that reason," Mohammed Fathi, the spokesman for electricity minister Qassem Mohammad al-Fahdawi, tells NPR. He says the $250 million transfer to pay for electricity was initiated through the government-owned Trade Bank of Iraq. Exporting electricity has been a major hard currency earner for Iran. Fathi says Iraq has needed the electricity imports partly because three years of fighting ISIS destroyed electrical power plants and reduced Iraq's ability to generate its own electricity. Although the sanctions — including sanctions that punish countries and companies trading with Iran — are meant to take effect in August, some transactions, including international bank transfers to Iran, have already been effectively barred in line with U.S. Treasury Department directives that they be implemented as soon as possible. U.S. officials referred NPR to these directives, when asked whether the sanctions could be the reason for the payments being blocked. Over the weekend, Fahdawi led a delegation to Iran to discuss restoring electricity that had been stopped for the past month due to what the electricity ministry, in a statement, called payment transfer problems and technical reasons. "Electricity is just one impact [on Iraq] of the sanctions on the Iranians. You'll see it elsewhere, not just in electricity, but in banking and other sectors," said Lukman Faily, a former Iraqi ambassador to the United States. "These are unintended consequences that [value] immediate gains at the cost of the long-term stability of Iraq." The U.S. spent more than $20 billion in reconstruction funds in Iraq after the 2003 invasion, much of it trying to restore the country's electricity and water supply. Despite the money spent, mismanagement both during the U.S. occupation and by subsequent Iraqi governments has left Iraqis with regular power cuts and unsafe water. The south of Iraq has been particularly neglected. The port city of Basra, a site of some of the protests, is within range of Iranian missiles and was hit hardest during Iraq's eight-year war with Iran in the 1980s. When Shiite Muslims in the Iraqi south rose up against Saddam Hussein after U.S. forces ended his 1991 invasion of Kuwait, the Iraqi leader punished them by sending in troops and depriving them of services. 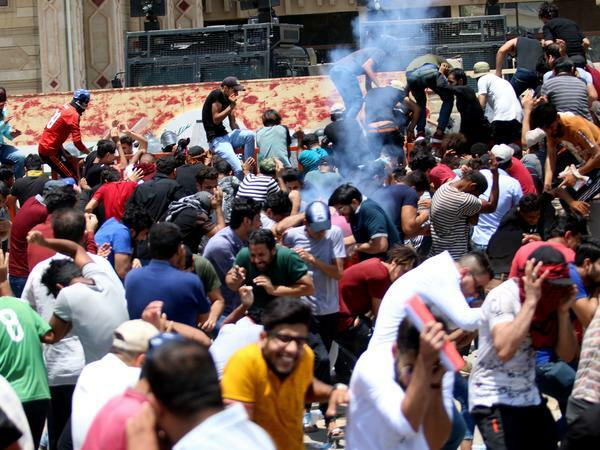 "We believe that all promises are lies," said Haider al-Helfi, a Basra resident who described himself as a protest organizer. Helfi, speaking at a protest outside of Basra's provincial council building on Sunday, says council members had refused to meet with them. "We are demonstrating because of the deterioration in services, unemployment and bad water," he said. "People want their rights." Protesters chanted that they wanted the government to fall and called for all political parties to leave Basra. Some said they blamed Iran for the crisis. In another part of Basra, protesters set fire to a huge billboard of Ayatollah Ruhollah Khomeini, the late Iranian spiritual leader. Protests spread from Basra over the past week to Iraq's other four southern provinces. The demonstrations were small but targeted: In several cities, demonstrators either broke into or set fire to offices of Prime Minister Haider Abadi's Dawa party and Iran-backed political parties. Demanding jobs, they blocked the entrance to the main cargo port near Basra and to several oil fields. International oil companies relocated some of their employees earlier in the week, flying them out by helicopter in some cases, according to an oil industry source who asked not to be identified while speaking about security matters. The demonstrations also spread to the holy city of Najaf, south of Baghdad. Iraq's most revered Shiite cleric, Ayatollah Ali al-Sistani, appeared to give the protesters a green light in a message delivered Friday. The normally reclusive religious leader said they deserved sympathy for their demands and noted that the majority of militia fighters who died fighting ISIS were from the south of Iraq. Abadi responded to the unrest by deploying soldiers and counter-terrorism forces to protect oil installations and government buildings. Security forces used water cannons and fired live ammunition in the air to try to disperse the demonstrators. Abadi, who heads a caretaker government and hopes to serve again as prime minister, is in a precarious position. He has promised in the wake of the protests to release the equivalent of $3 billion in funds for investment and services in the south — but it's not clear that he has the authority to do so — or that the money could be spent quickly enough to make a difference. Parliamentary elections in May resulted in accusations of widespread fraud and have led to a recount of some of the results. It could be months before the winning parties are able to form a coalition government. Meanwhile, the protests show little sign of ending.